Lisa enjoys treating Pediatric, Orthopedic, and Sports related injuries. 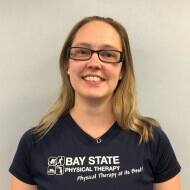 Lisa has worked at Baystate Physical Therapy for over 10 years, where she has continued to train in a variety of manual skills and on the McKenzie treatment approach for spinal dysfunctions. She has completed numerous continuing education courses for advanced treatment of the neck, shoulder, back and the foot and ankle. Lisa is married with 3 very active children. Her family is actively involved in her church and with fundraising projects at her kids’ school. Lisa sees patients daily from Monday through Friday in the Attleboro office.